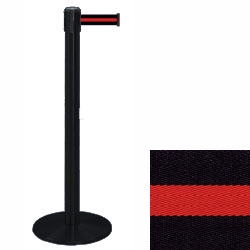 This stanchion w/ red & black stripe belt has a satin finish. 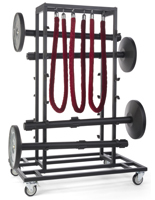 This retractable rope is 2"w and 7.5'l, and should be spaced 7' apart to be most effective. This 24 lbs. 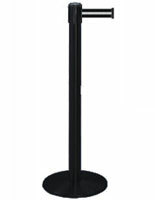 stanchion w/ red & black stripe belt features a 13.5"d metal weighted base. 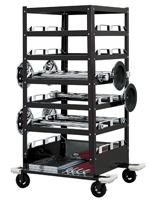 An ABS cover keeps this unit scuff-free. 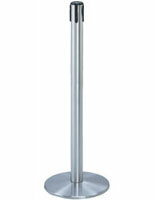 This stanchion w/ red & black stripe belt has a weighted metal base for stability. Here are some helpful layout options for higher traffic areas: Dual Belt Posts.